This map, along with all my other maps, is posted in the Map Room. I’m confused. Is SMART being delivered because it services current (meagrely and uneconomically low) ridership projections, or will it only really become economic if high density housing can be built in locations across Marin and Sonoma? Your figures compare very different transit systems to SMART – these other systems connect into major metropolitan employment centers and transit networks, unlike SMART (which may one day based on a leap of faith). It all seems very “back to front”. Is the train justified or does it need to be a trojan horse for high density housing before it even gets near being marginal? I wasn’t even trying to tie this to SMART except for the hypothetical commuter line to Cloverdale. 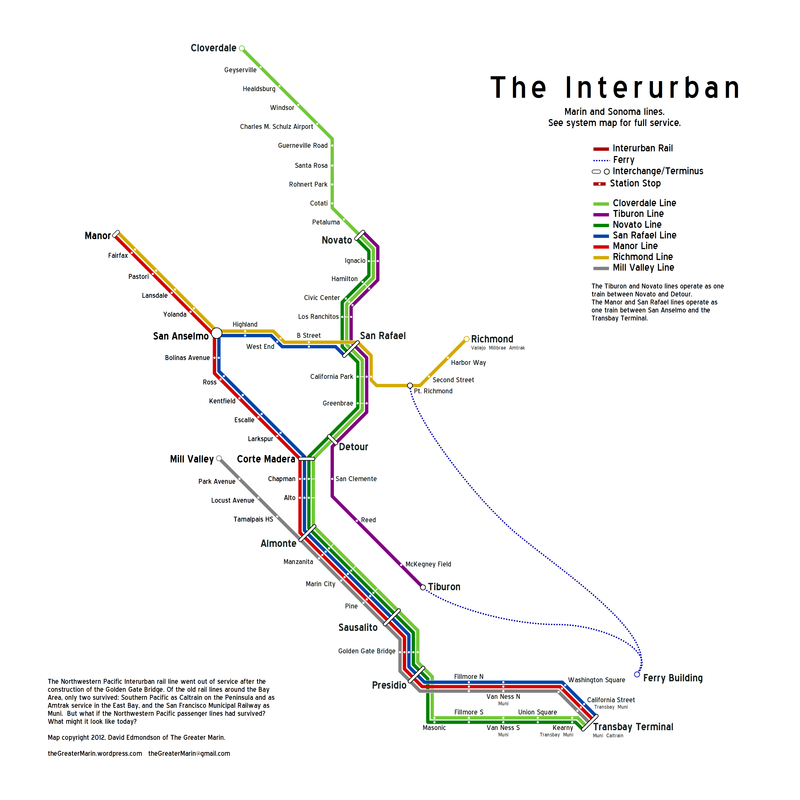 The Interurban was an electric light-rail transit system that ran on a third rail like BART and Skytrain. It ran frequently and connected directly with ferry service in Tiburon and Sausalito. SMART is a diesel commuter line that will run infrequently and connect indirectly with ferry service. I analyzed cost a while ago, and the idea of extending SMART to San Francisco a bit before that. In short, SMART is a bit on the expensive side per passenger but is nowhere near boondoggle territory. On a per mile basis, it’s actually quite cheap. Extending it to San Francisco would require it to take ALL transit trips to San Francisco as well as 40,000 additional passengers per day just to get to the same cost per passenger as SMART’s IOS. Cost sharing with Muni for the Geary segment would help, but why not just build the Geary segment without the weight of Marin? SMART has made some truly idiotic decisions that make it more expensive and less viable than it should be, but it is justified without land use policy changes. If San Rafael wants to use it as an excuse for more housing, that’s on San Rafael. If and when such projects become viable, it will be because cars simply cannot solve the problem. The automobile transportation system works well, with some very special exceptions. The automotive transportation system works well, with some very special exceptions. I didn’t see even the hint of compromise in that list of facts. So I can’t tell from those numbers: Are they trying to get us to spend more unsustainable money on roads subsidizing the trucking industry, or get us to give up on those dangerous trucks and build development patterns that could be better fed by rail? Without watching the video (which I don’t have the bandwidth for here on the bus, and which I’m against in principle because if you have a good argument you’ll freakin’ write it down) I can’t tell.